Expediate your Karma, explore Right Attitude: The Foundation for a progressing Ego. 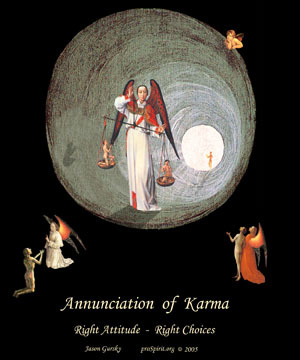 The Annunciation of Karma is available as posters from art.com in the following sizes and costs. Shipping and sales tax are extra. Posters are made at 300 dots per inch (dpi) and will be clearer than displayed on the Internet at 72 dpi. The print is the image only and does not include the color matting examples. The following print mattings are shown only as sugestions. Art.com will print and ship to you only a poster print, unless you order framing. Framing is available from art.com, where you can choose your own color mattings, dimension of cuts, and color and size of frames.